Gold is particularly sensitive to the words that emanate from the Federal Open Market Committee (FOMC) in the US. The precious metal has been on a long-term downtrend that started when the tapering (the gradual reduction and eventual elimination) of Quantitative Easing (QE) was first mooted by the former Fed chairman, Ben Bernanke, back in October of 2012. While this trend has been punctuated by periods of retracement and ranging, we are not in favour of going long (buying) gold at all under the present circumstances. 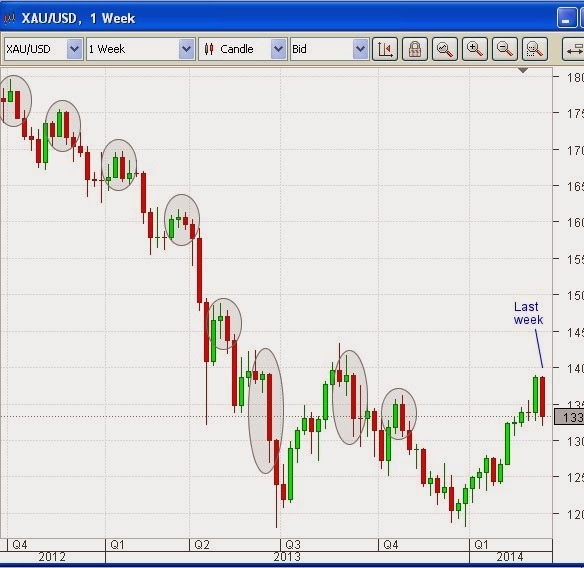 We currently hold a short position in XAUUSD, the gold spot market contract that we trade from time to time. After the last FOMC meeting the comments made by Janet Yellen, the new chair, were interpreted by the market to be broadly hawkish. That is to say, she and her colleagues on the committee were judged to have moved to a position where they are expected to tighten monetary policy somewhat sooner than had previously been thought. Apart from the continued tapering of QE, this also takes into account the possibility of raising core interest rates in the mid-term, when interest rate rises in the US have up to now been totally off the agenda since the start of the Global Financial Crisis, which came to a head in 2008. All of this is calculated to cause a fall in the price of gold. That is the fundamental side of the analysis of gold. Technically, the spot market contract has just completed another week where the closing price is lower than that of the opening of the previous week, when that was an up-week. This is known as a bearish engulfing candle. As can be seen from the chart above, this pattern often presages a period where price will move in the direction of the candle that does the engulfing. This could be important for no other reason than that such patterns are observed and acted upon by a great many traders around the world. The HSBC Flash Purchasing Managers’ Index (PMI) for March was announced earlier this morning (GMT) and has come in lower than expected. This is the fourth month in a row in which it has been both below expectations and also at a level that indicates contraction in manufacturing. However, the currency markets have reacted very calmly to the news, with the Aussie dollar actually rising in the aftermath. The Australian currency had been very sensitive to Chinese economic news, as China is a major user of Australian exports. The US dollar is also strengthening against most other counterparts, which would seem to indicate that a Chinese economic slowdown is becoming priced into the markets and is no longer seen as a threat to the world economy. The global economic situation would appear to be dominated now by developments in the USA, where the Federal Reserve has seemingly convinced market participants that things are, at last, genuinely on the rise.